One of the best things about becoming familiar with a new culture is trying new, exotic foods. On your journey to learn to speak Korean fast, I’m sure you’ll begin picking up on names of dishes that you’ve never heard of, and that list of names will continue to grow the longer you study the language. Whether you’re in a Korean BBQ restaurant in your current city or you’ve made the trip and are exploring the authentic street food of Seoul, we’ve compiled a list of some delicious Korean foods you should be on the lookout for! Don’t be alarmed if some of these dishes are like nothing you’ve ever seen before – Korean cuisine is known for incorporating exotic complementary flavors and often incorporates bright colors and funky textures. Each of the dishes on our list have something unique that sets it apart from the rest, so try as many as you can to get an accurate taste of Korea! 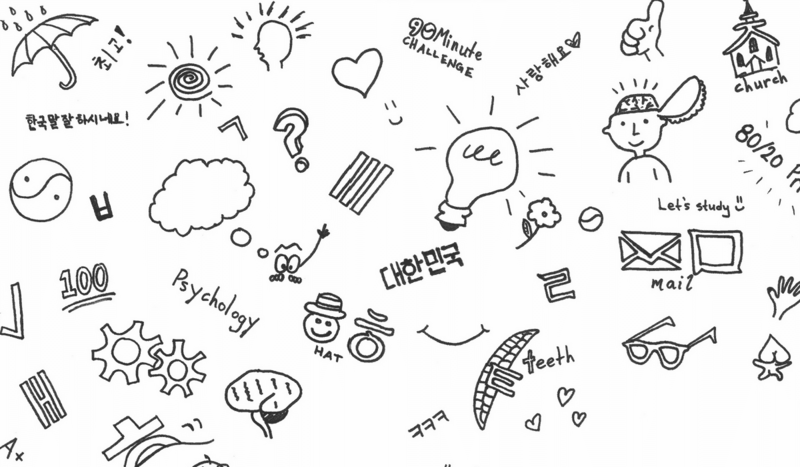 We’ve included the names of food in Hangul, the Korean alphabet, so you can find them in Korea more easily. 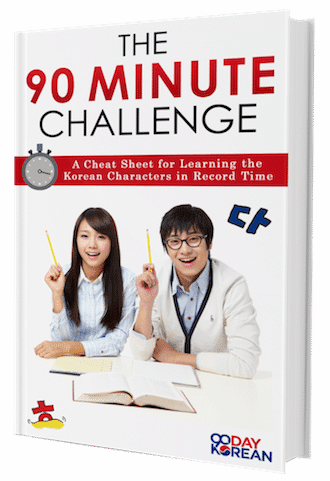 If you can’t read Hangul it is possible to learn in just ninety minutes, so what are you waiting for? Kimchi is also pretty versatile – while classic, cabbage-based kimchi is a the original favorite and is available pretty much everywhere in Korea, different types of vegetable can be salted and fermented to create different tastes (with some being more spicy than others!). If you’re looking for a way to spice up an otherwise bland dish, incorporate one of the many types of kimchi! It’s a classic crowd favorite for a reason, and you won’t be disappointed. 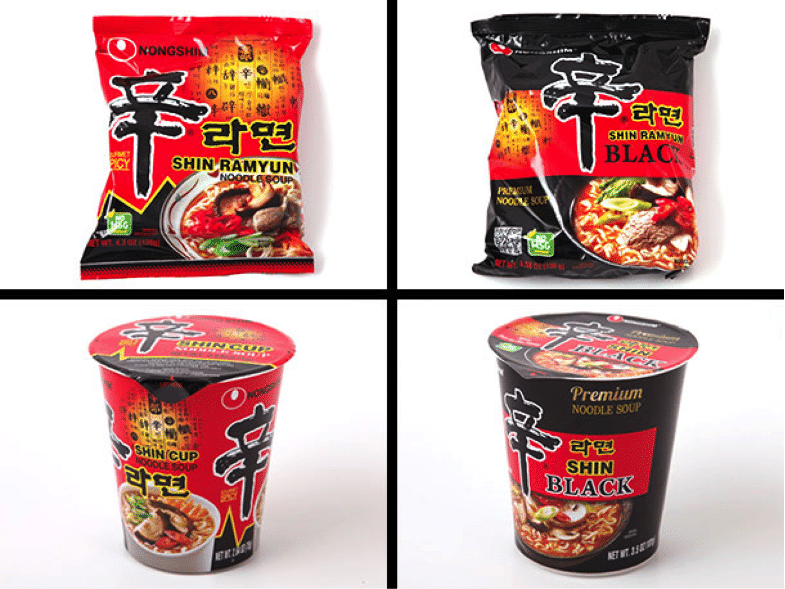 Instant noodles are a dish that have unarguably transcended cultural barriers – while popularized in Korea, they’ve become a kitchen must-have all over the world. Short on time? No worries! These noodles only require a couple of steps and are ready as quickly as water boils – just follow the directions on the back of the packet. Short on money? No problem. Instant noodles are notorious for their less-than-intimidating price tag. You can probably pick up a pack for less than the change that you have in your pocket right now. While basic instant noodles are a relatively uncomplicated dish, there’s plenty you can do in the kitchen to spice up your noodle dish and make it a little more interesting. Try adding eggs, tuna, or tofu – these Korean favorites can help a boring dish transcend to something sublime! Whether you’re treating instant noodles as a side or your main course, you can’t go wrong with incorporating this classic dish into your meal. Instant noodles have become so popular in Korea that there are even simple but unique ways you can eat them that will really impress your Korean friends! 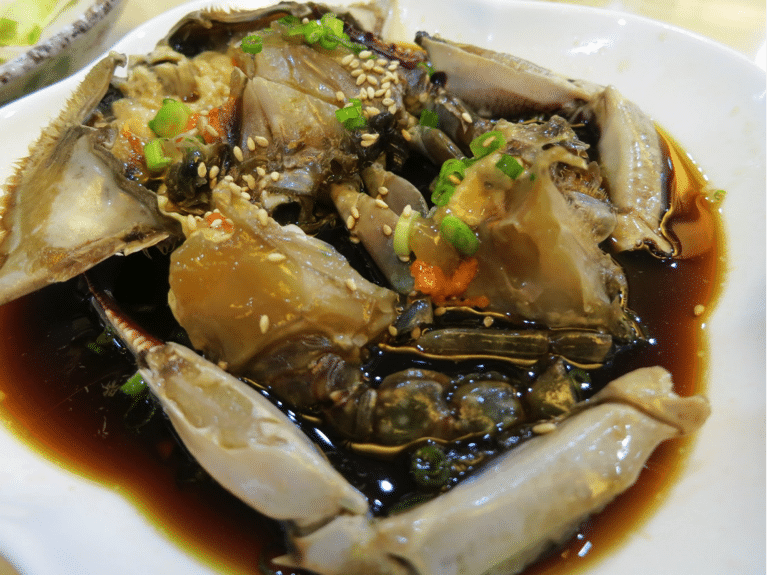 As far as seafood dishes go, ganjang gejang (crab prepared by soaking in soy sauce before serving) is a Korean favorite that’s not for the faint of heart. Ganjang gejang is a powerful dish served cold, and it’s notorious for its bitter aftertaste that tends to linger long after the dish is gone. Though this dish is on the intense end of the spectrum, it’s also insanely popular – the dish’s nickname is “rice thief,” because the sauce is so delicious that it’s hard to resist piling extra rice onto your plate to soak it all up once the crab is gone! The next time you’re out and see ganjang gejang on the menu, consider ordering it so you can taste what all the fuss is about – you may find that you have a new favorite dish! Raw slices of beef may sound intimidating at first – fear not, foodies. This dish is perfectly safe, and is known as steak tartare in other countries, which is considered a delicacy most places and can be found in fine dining establishments. This dish can either be served as a standalone meal or as a topping on another dish, but if it’s your first time I recommend ordering it as a standalone dish so you can appreciate the flavor (and the experience) without distraction from other strong flavors. Be warned, however – while tasty and tender, the price for the dish can be a bit higher than average, as chefs choose the best selections of beef to star in the dish. 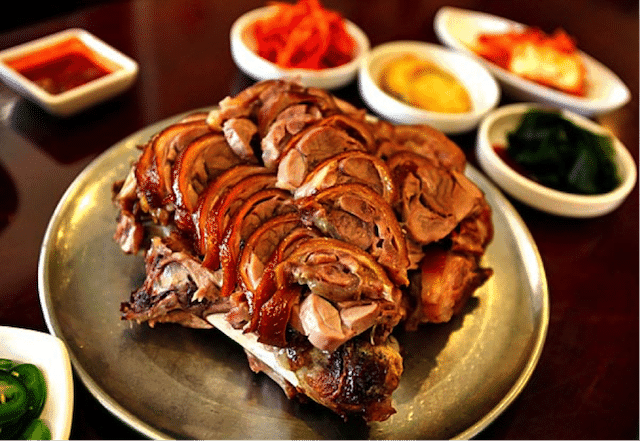 If you love meat and don’t mind paying a little bit extra to get a meal you know you’ll love, yukhoe may be the delicacy for you! 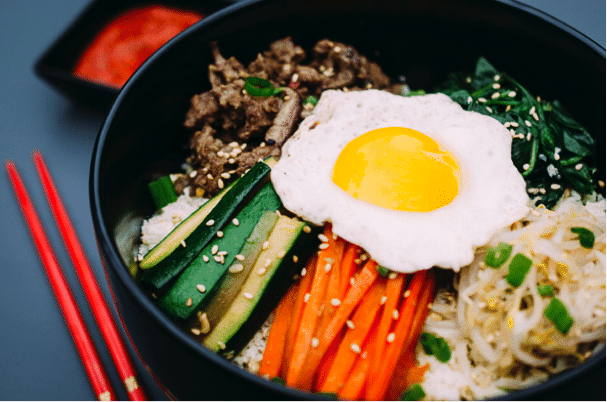 If you’re on your lunch break and are on a time crunch, bibimbap may be the perfect dish to leave you satisfied and get you back to the office on time. A Korean favorite, this dish takes multiple food groups and combines them in one lunch bowl to make sure you’re getting a balanced lunch in a simplified form. The dish combines rice, vegetables, meat, and egg for a balanced flavor, so it also hits all of your major food groups for the day. Sesame oil and chili paste are added to the dish for a little extra flavor to really bring the dish together and add a spicy element that makes it so popular. 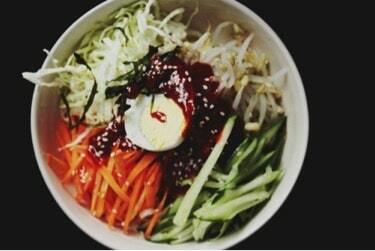 While bibimbap used to be a dish meant for Korean royalty, it’s now accessible all over Korea and a crowd pleaser. Give it a try on your next lunch break – you’ll be glad you did! I’m sure that you’re familiar with soy sauce – soy sauce is a staple in many Asian cuisines, and it complements pretty much anything due to its savory nature. However, did you know that soy sauce is a byproduct of doenjang? 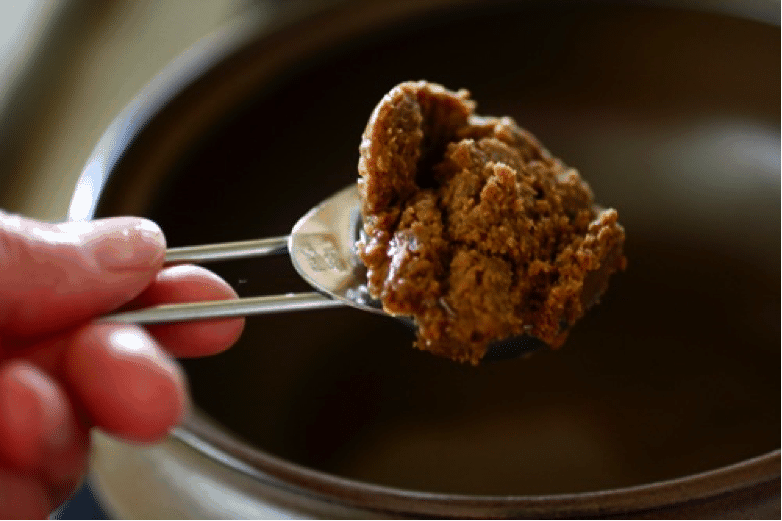 Doenjang is a paste derived from fermented soybeans – it boasts a strong taste and a not-so-appealing color, so it’s not quite as popular as soy sauce on its own. However, doenjang is a beloved Korean food that can spice up simple dishes in a way that other spices can’t, if you’re looking to add a little more character than soy sauce can provide on its own. Give it a try in bibimbap – the taste may be something you’ve never experienced and set a new spice standard for your meals! How do you like your pancakes? Warm, with maple syrup? How about full of seafood? 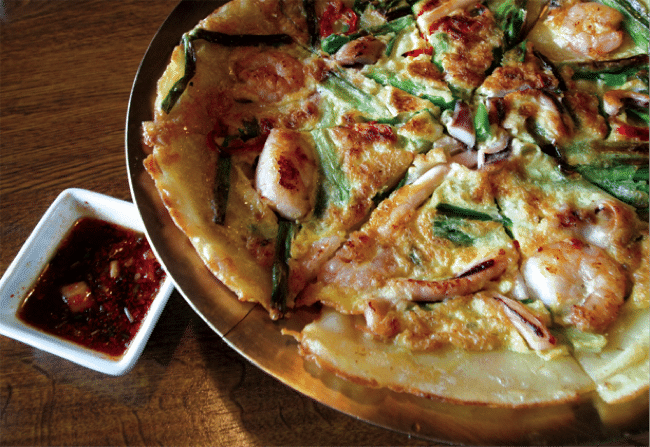 This Korean food is a dish that turns the basic pancake concept on its head. These crunchy pancakes are stuffed to the brim with different types of seafood, resulting in a satisfying, savory meal. These pancakes are said to go well with rice wine – pour yourself a glass and enjoy this intricate Korean dish. Don’t let the name scare you! Ox bone soup is a delicious Korean favorite that proves that a simple dish can be better than more complex dishes if it’s done well. Ox bone soup only has a few ingredients – meat, noodles, and a couple of sparse scallions float around in a milky-white colored broth for an extra kick. This is the perfect dish for a cold day, or if you’re feeling a little under the weather – think of it as a Korean rendition of the classic Chicken noodle soup cold cure. Warm, satisfying, and simple, give this dish a try the next time you’re looking for a classic cold-weather meal! 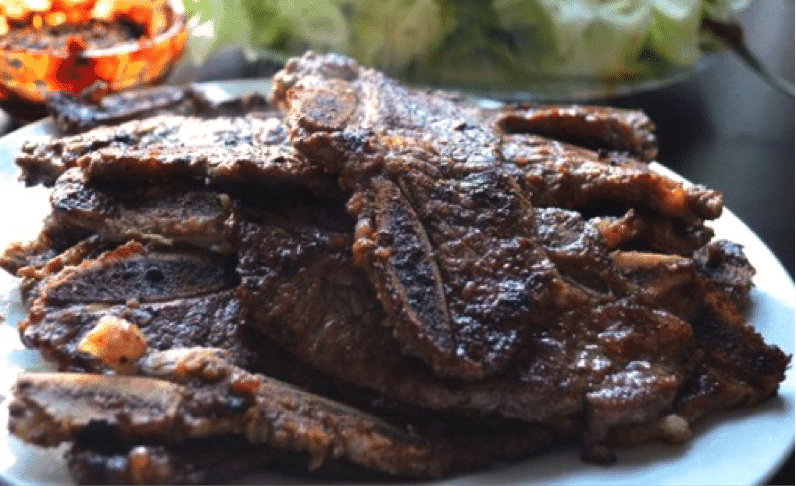 If you’ve been to a Korean restaurant recently, chances are that you or somebody at your table decided to go with galbi. Galbi literally translates to “rib,” and if not specified, the dish can be centered around one of a variety of meats depending on your preference (pork, chicken, or beef more often than not). Strips of meat are prepared with soy sauce, sugar, and garlic before being cooked over an open fire to ensure the outside is seared while the inside remains tender. The combination of the sugar and the soy sauce along with the garlic really bring out the subtle flavors of the meat, and make this dish a delicious and tender favorite. This traditional dish is a crowd pleaser at Korean BBQ restaurants, and for good reason! More often than not, the dishes at your favorite Korean BBQ spot will revolve around tender strips of different meats (hence the ‘barbecue’). Jogaegui is a fun way to mix it up if you’re looking for something a little different! 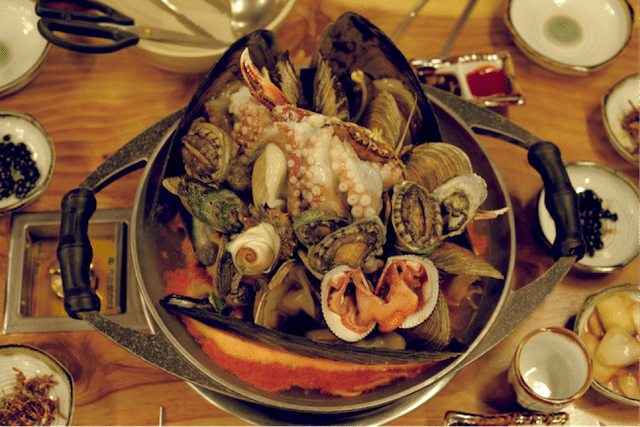 Shellfish is cooked over an open flame until it’s hot and ready for you to dig into – the shells crack open on their own, adding an extra flair to this Korean favorite. Jogaegui is especially good if you can get it fresh from the ocean, because what beats fresh shellfish that was caught earlier that day? Give this dish a try to incorporate some saltwater fun into your meal the next time you need a break from meat! Don’t knock it before you try it! While “snail” isn’t a word that makes most people’s mouths water (unless you’re an escargot fan), sea snail salad is a traditional Korean dish that pairs perfectly with an alcoholic beverage – something about the taste of snail and the bitter taste of alcohol really complement each other. Had a long week at work? Look no further! Relax with a beer (or two) and dive into some sea snail salad for a spicy treat to take an edge off. This dish is a fresh approach to more traditional noodle dishes – rather than being served hot, these noodles are served cold, and are chewy as a result. 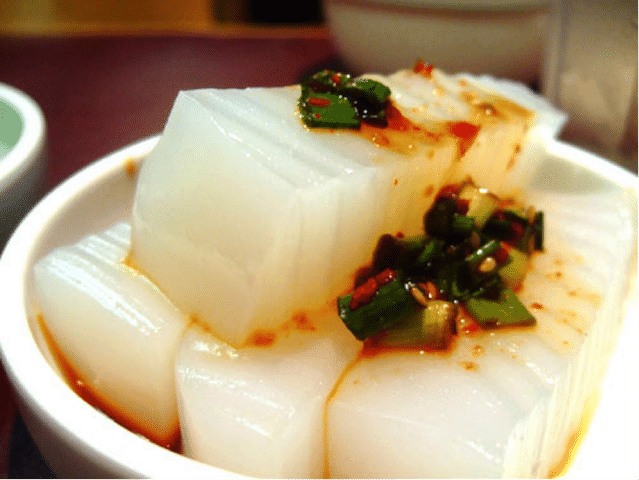 The temperature of the dish makes it refreshing, so this is a great dish to enjoy during the sweltering Korean summer. Extra thick noodles are combined with spicy chili paste and a variety of fresh vegetables, and they all come together to form something magical. Dig into a bowl of jjolmyeon for a refreshing (yet spicy!) snack, and you’ll quickly understand all of the hype. While some of the dishes on this list are intricate and have a long list of ingredients, bossam is a dish that is evidence that simple can still be delicious when the components are delicious on their own. Bossam is steamed, tender pork sliced into small, nearly bite-sized pieces that is then wrapped in crisp lettuce and served with a dab of dipping sauce as a finishing touch. The wrapping and dipping combines the different textures of the lettuce and the steamed pork that really take this dish to the next level and make it a treat. The next time you’re craving a meat-based dish or need some extra protein, have some bossam and leave the table feeling satisfied. This dish is often served with some of the spicier options on this list to bring the meal together – and give your mouth a break from all of the spice! An egg is beaten, steamed, and baked into a moist, dense cake, resulting in a dish that is mild in flavor and soft to the touch. Served plain or with vegetables and sesame seeds on top to bring out the slightly salty flavor, give this dish a try the next time your eyes are watering from a spicy dish! Something about the mild taste of the egg acts as a neutralizer for a lot of spice, so if you’re in over your head with a dish’s spice factor this dish will help you cool off. 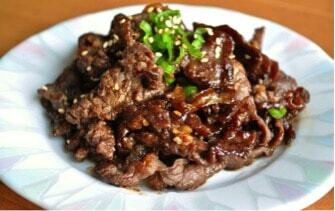 Bulgogi is a delicious Korean food that is widely recognized as quintessential to the cuisine. 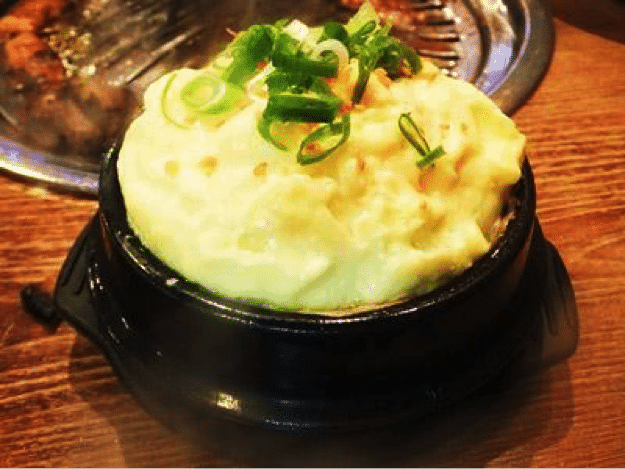 The dish has long been a part of Korea’s culinary history – it has been enjoyed by millions of people for thousands of years, so it has definitely stood the test of time! 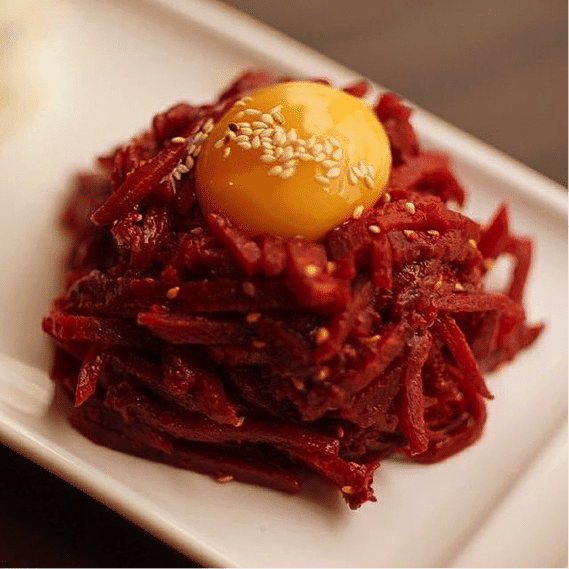 Bulgogi is a sweet meat that has recently been incorporated into a variety of modern dishes, so it’s easy to find at most restaurants. The next time you’re in Korea, make sure you try a bulgogi burger for a modern twist on a classic favorite! Do you like to take a walk on the culinary wild side when you’re dining out? Do you live for trying dishes that test your palette and make your eyes water? If so, make sure you add this dish to your list! 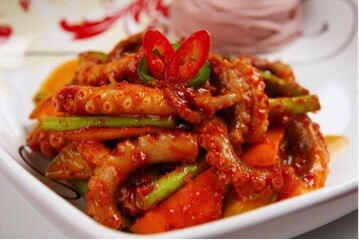 Octopus is stir-fried with a medley of extremely spicy ingredients (chili powder and two different types of hot peppers), resulting in a combination that will surely make your mouth water. The octopus is seared to the point where it’s tender on the inside and the sauce is thick and smoky, making the dish hard to stay away from. Pair it with gyeranjjim for a well-rounded meal that is packed with flavor – just make sure you’re a fan of spice before doing so! 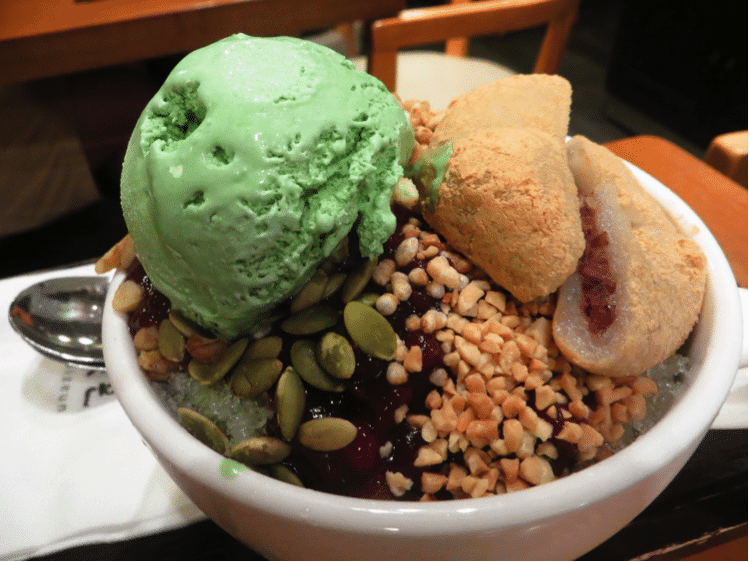 If you need something sweet to tie together a rich meal, give bingsu a try for a decadent treat! Bingsu is a dish in which sweetened red beans and tteok (made of rice flour) are laid atop refreshing freshly shaved ice. There are many different variations depending on your preferences – condensed milk, fruit, and corn flakes can be incorporated for different flavor and texture combinations. This dish can be as simple or as complicated as you’d like, so feel free to mix and match flavors until you find your favorite. Bingsu is everywhere – be sure to give it a try during the summer months for a sweet end to an otherwise delicious meal! 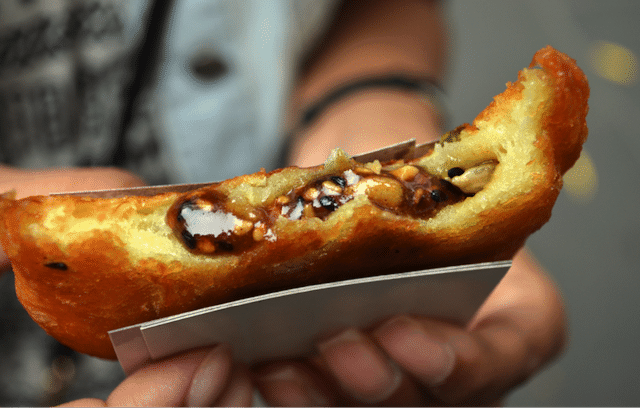 If you’re out in and about exploring the streets of Korea and looking for a snack to tide you over until dinner time, indulge in some street fare and give sundae a try. A favorite Korean street food (for good reason), Sundae is a type of sausage that Korea picked up from Mongolian influences hundreds of years ago. Cooked pig lungs and liver are often served on the side of this dish as additional accoutrements, which are salty in taste and are much more delicious than they sound. Korea is full of street dishes for the more adventurous diners out there – get started on your street food journey with some steaming hot sundae! 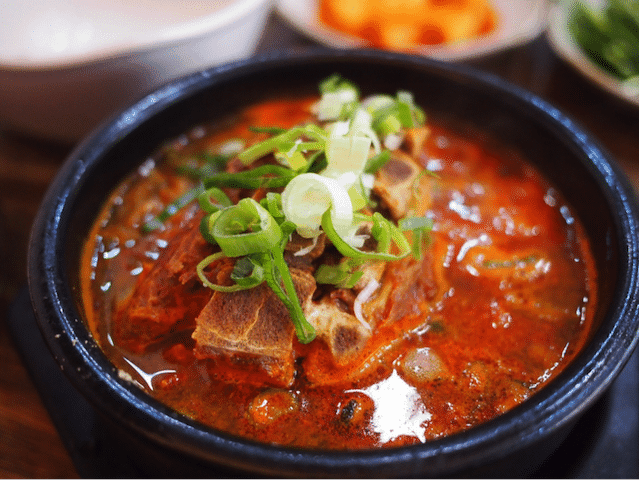 The Korean drinking scene is no joke and not for the faint of heart – with a ton of interesting Korean alcohols like soju available at most bars, restaurants, and grocery stores, it should be no surprise that a dish called affectionately ‘hangover stew’ is a staple throughout Korea. This stew is made with congealed chunks of ox blood, and something about the sodium content helps immensely with waking your brain up when you’ve done some damage the night before. Don’t let the blood scare you! If you’re spending time in Korea in the near future, you’ll probably spend some time enjoying the great bars scattered throughout the country, so this dish will definitely come in handy. Give hangover stew a try the next time you need to roll out of bed bright and early after a night of drinking, and you’ll see why the Koreans can’t do without it. The origin story behind this warm, satisfying stew is as interesting as its name! Army stew soared in popularity immediately after the Korean War, when times were tough and meat was expensive and hard to come by. It’s filled with pantry staples like spam, American cheese, and instant noodles – all foods that were easily found at an army base in Seoul and widely available to the public. The best part about Army Stew is that you can mix and match ingredients based on what you have in your pantry or fridge at any given time, so there’s no need to run out to the store to pick up specific additional ingredients – how convenient is that? Give Army Stew a try the next time you REALLY don’t feel like trekking to the grocery store before cooking dinner and you may be surprised at what you come up with! How do you feel about intestines? If you instantly said “no way,” hear me out! 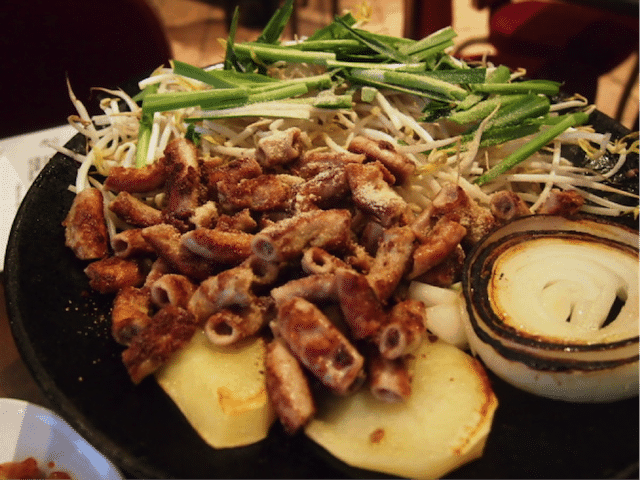 Gopchang is a dish consisting of stir-fried or grilled pork or cattle intestines, and while it may sound a little horrifying, it’s actually a staple in many Korean cities due to the intense flavor of the intestines and the versatility of the dish. 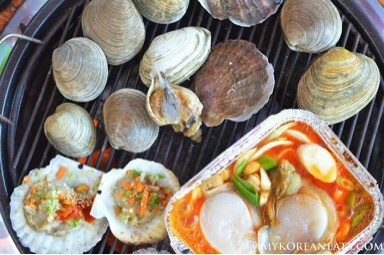 Paired often with Soju, gopchang is served at most Korean barbecue restaurants and has a great texture when grilled. As an added bonus, its unique flavor pairs well with pretty much any starchy Korean side dish, so it’s easy to incorporate into a larger meal. Plus, think of it this way – if you try gopchang even once, you can tell all of your friends you’ve eaten intestines! Dubukimchi is a dish featuring three distinct, different flavors – tofu, pork, and kimchi. While tofu isn’t necessarily exciting on its own, it pairs wonderfully with the stir-fried pork and kimchi in this dish because the intense flavor of the latter two balances out the subtle flavors of the tofu. 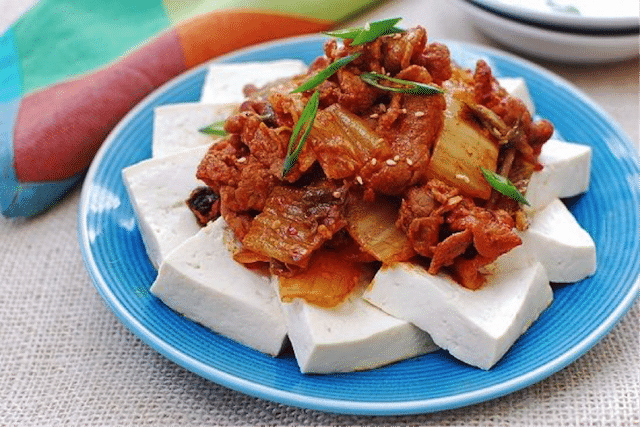 The tofu brings together the intense flavors of the kimchi and the pork, which need the tofu to bring them together into a cohesive, balanced dish. This dish is also jam-packed with protein from the tofu and the pork as well as nutrients from the fermented kimchi – you’ll be making your body happy as well as your taste buds! Order a plate of dubukimchi the next time you want a solid, satisfying entrée full of flavorful elements that are great on their own and as a trio. You won’t be disappointed! Dotorimuk is a curious dish – made from acorn starch solidified into cold, dense jello, dotorimuk is a similar fish to tofu in that it is full of protein and a vegan friendly dish. It is also versatile in its flavor in the same way that tofu is – dotorimuk does not have a distinct flavor of its own, so it can be served with a variety of flavors and textures to enhance or bring together a dish because it takes on the flavor of what it is prepared with. Dotorimuk is frequently served as a side dish, and can be paired with soy sauce to make the flavor more exciting. Take a walk on the wild side and order a side of dotorimuk the next time you see it on a menu! Are you the adventurous one in your group of friends? Were you the kid on the playground that could be found messing around with beetles? If so, I have a dish for you to try! Beongdegi is to Koreans what boiled peanuts are to New Yorkers – you can buy beondegi at carts stationed throughout Korean cities, and it’s usually eaten on the go while out and about. 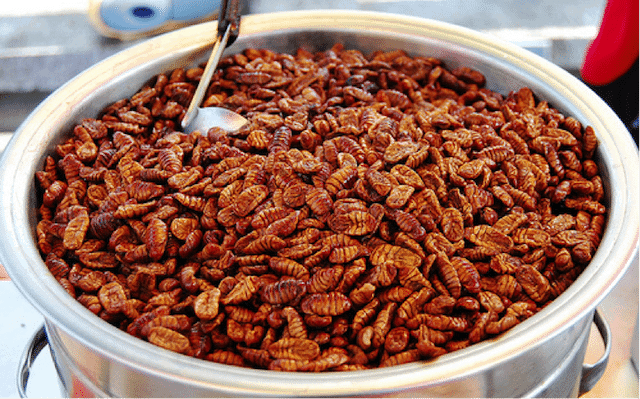 Beondegi is silkworm larvae steamed and served in the juice produced during the cooking process. It’s popular for a reason, though, so don’t knock it before you try it! 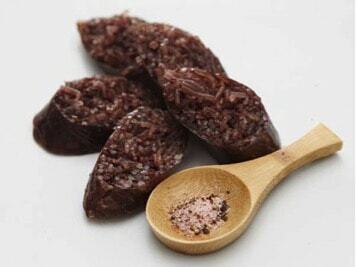 While the texture definitely takes some getting used to, beondegi is packed full of protein and is very inexpensive and accessible, making it a popular snack. Give it a shot the next time you see a beondegi cart – once you get past the shock of feeling larvae in your mouth, the taste is quite pleasant! Kimchi pairs well with almost everything, so it’s only natural to make its unique flavor the focus of a stew! 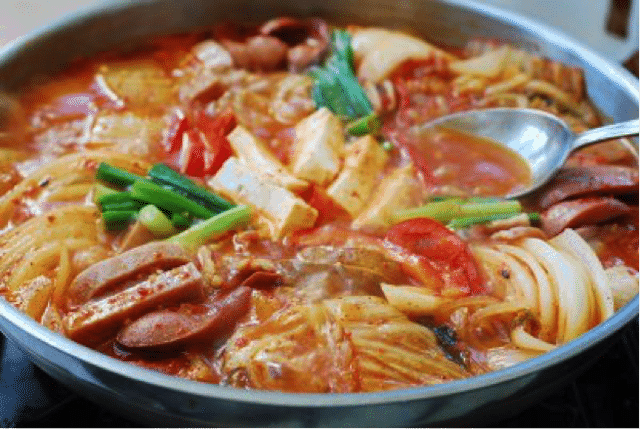 Kimchi-jjigae is one of the most popular South Korean stew dishes out there, and the popularity of this stew is no surprise when you consider how popular kimchi is as a standalone dish. 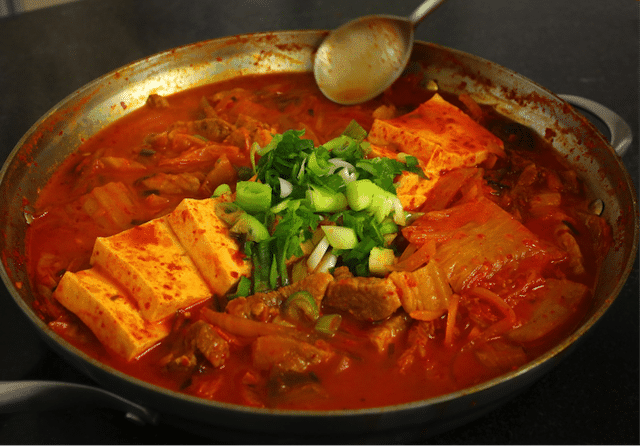 While the vegetables and meat that the stew incorporates can change from restaurant to restaurant depending on preference and what is available, the most popular versions of kimchi stew includes tender, savory pork, scallions, and a whole lot of kimchi. You can mix and match with the protein and vegetables that sound best to you, so this warm, filling meal can be whatever you want it to be! Try a bowl of kimchi-jjigae the next time you want something that will fill you up and provide some intense flavor profiles at the same time. What’s not to love about dumplings? They’re quick to prepare, easy (and fun) to eat, and can be filled with any number of interesting and delicious ingredients based on your preference. One of the most popular types of dumpling in South Korea is the steamed mandu dumpling, or jjinmandu. 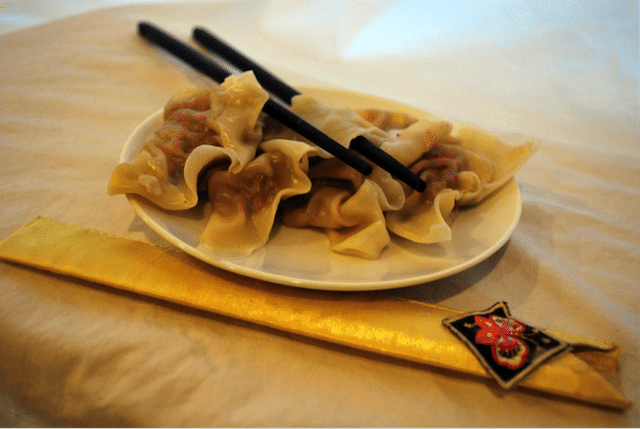 Jjimandu features a wrapper made from a noodle-like dough filled with a satisfying mixture of pork, vegetables, and mung bean noodles. You’re most likely to find them steamed, but they can also be pan-fried if you’d like to incorporate a little bit of a crunch. Give jjinmandu a try the next time you’re looking for an easy-to-prepare snack – they’ll definitely hit the spot! If you’re a fan of pork and don’t mind taking a walk on the culinary wild side, put jokbal on your list of “Must Try Korean Dishes.” Jokbal is pig’s feed dipped in a savory red shrimp sauce, and it tastes WAY better than it sounds! First, the feet are cleaned and boiled until tender, at which point they’re seasoned to perfection and served. 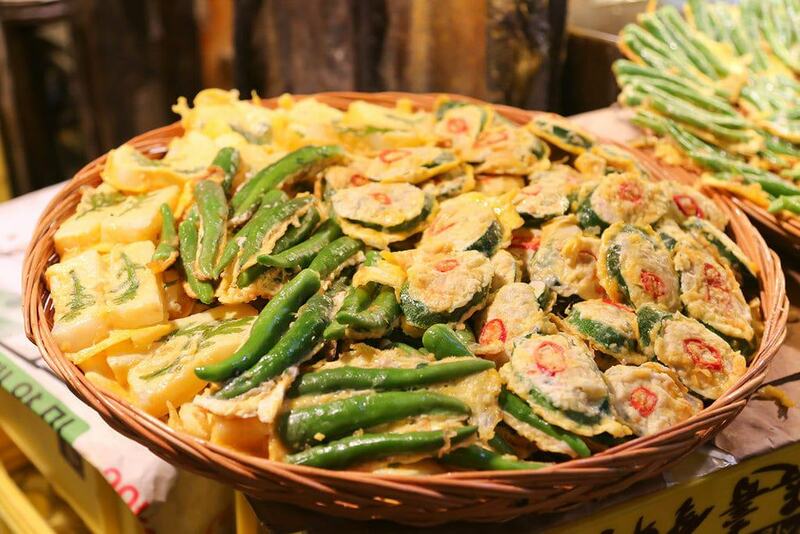 You’ll most commonly find jokbal as a large appetizer than can be shared among several people, so bring some of your more adventurous friends with you to share in the jokbal experience. They’ll thank you afterwards! For a sweet potato lover, japchae is a dream come true! This popular Korean dish features sweet potato noodles stir fried with a variety of vegetables often including mushrooms and scallions in hot sesame oil. Japchae is then flavored with soy sauce and sesame seeds, adding some texture and a delicious savory flavor profile that brings the dish together. This dish is a lighter option than many noodle dishes because the noodles are made from sweet potato, so if you’re watching your figure and need your veggie fix this dish will be one of your favorites while you’re in Korea. 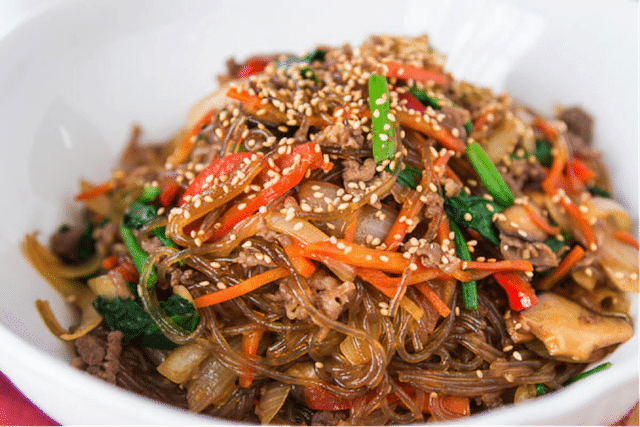 Japchae can be enjoyed as an appetizer, a side dish, or an entrée depending on what you stir fry with the noodles and how hungry you are – to make it filling enough to be an entrée, beef is usually incorporated as an additional ingredient. Cooked octopus is delicious, but have you ever tried LIVE octopus? Sannakji is a Korean delicacy that features live octopus cut into bite-sized pieces and flavored with sesame oil and sesame seeds. Intriguing, right? 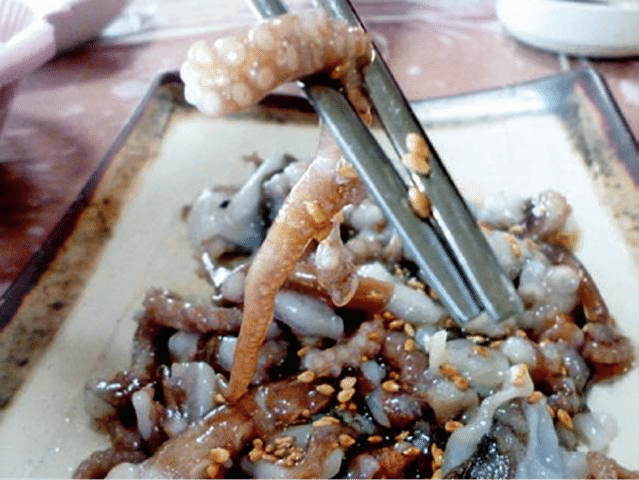 Be careful when you’re eating this Korean dish – the tentacles can (and do) wiggle in your mouth as you chew and swallow them, so an unsuspecting diner will be in for a surprise if it’s their first time trying sannakji. Cross this one off your culinary bucket list the next time you see it on a menu – the taste is amazing, and the experience is one you won’t forget soon! 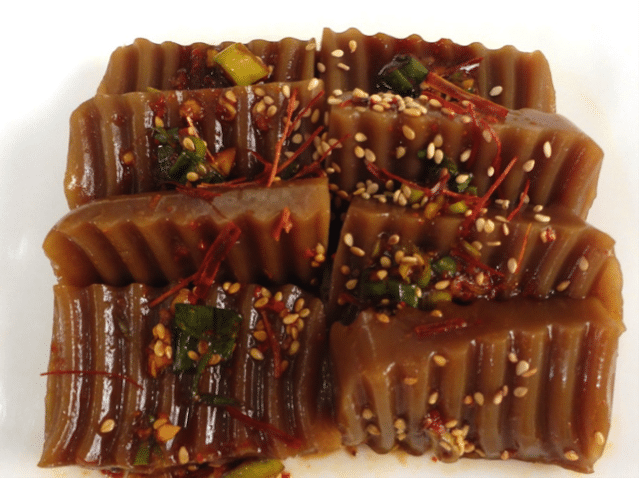 Similar to dotorimuk, nokdumuk is a jelly made from green beans that is off-white and almost translucent appearance. Nokdumuk is most often served as a side dish with an intense sauce like soy sauce and a scallion garnish, seeing as it doesn’t have much flavor on its own and will take on the flavor of the sauces it is flavored with. Though not as exciting as some of the dishes on this list, nokdumuk is an underrated side dish with an interesting texture and a whole lot of protein that pairs especially well with Korean barbecue dishes. 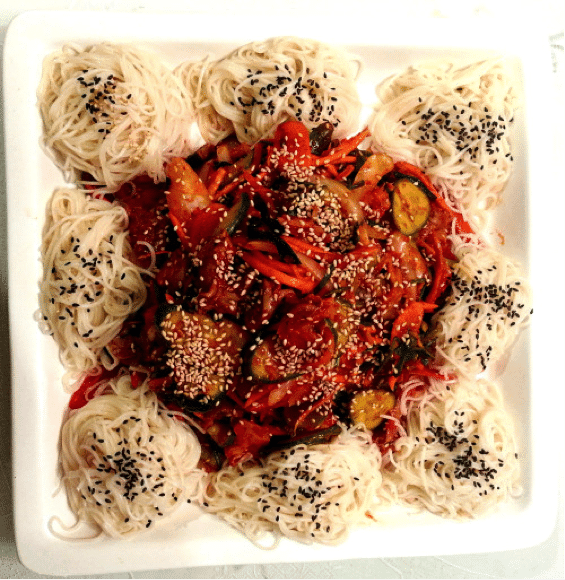 Nokdumuk is most often served at special events, so you’re likely to see it on the menu the next time you find yourself attending a Korean wedding! Don’t worry – if you can’t wait until your next wedding to try this Korean staple, you can also find it at some Korean restaurants as a side dish. If you’re a dessert fan as well as a pancake fan (and really, who isn’t? 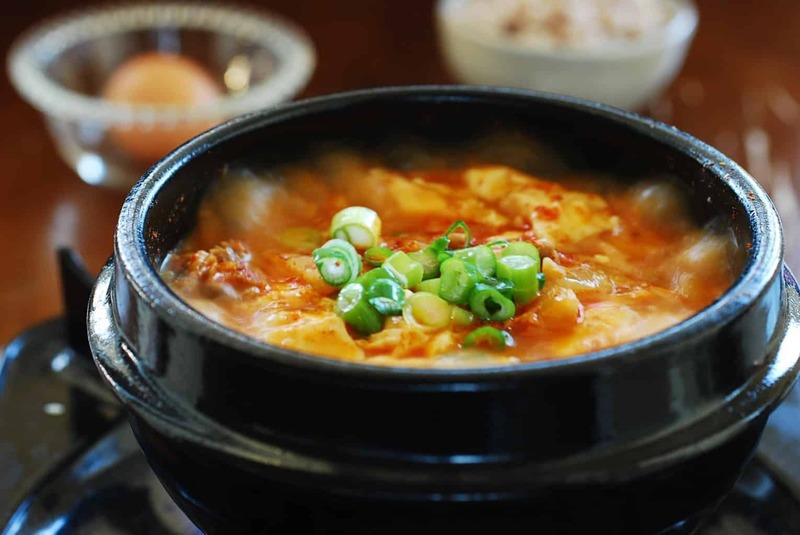 ), you MUST add hotteok to your list of Korean foods to try. Hotteok is a delicious pancake filled with honey, peanuts, and brown sugar. With that many heavenly sweet ingredients incorporated into one dish, what’s not to love? Hotteok are also easy to eat on the go, so they make a perfect after-dinner snack for when you’ve left the restaurant and to stroll around with friends. If you find yourself craving something sweet and you pass a street food cart, pick up some hotteok and satisfy your sweet tooth. If you’re on board with the pumpkin trend that has surged over the past couple of years – pumpkin spice lattes, pumpkin candles, even pumpkin-scented perfume – hobakjuk is right up your alley! 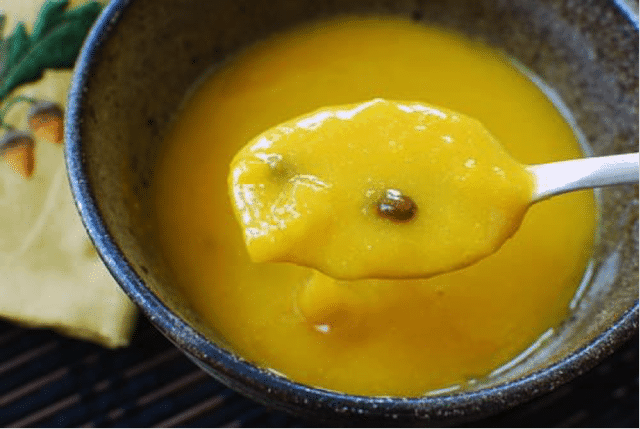 A traditional pumpkin porridge made from sweet, satisfying steamed pumpkin and rice, hobakjuk is a versatile dish that can be served both hot and cold depending on preference. Heat up a bowl of hobakjuk the next time you’re trying to warm up on a cool autumn or winter day and you’ll fall in love with pumpkin all over again! Another dish for our readers that are willing to push the envelope when it comes to trying new (and sometimes intimidating) food, dalkbal is a dish featuring chicken feet. Most often, dalkbal includes a thick red pepper sauce that coats the chicken feet and adds a strong, unique savory element that makes the dish worth trying. Most people only eat the skin off of the chicken feet, but you can also chew on the bones if you’re feeling adventurous. 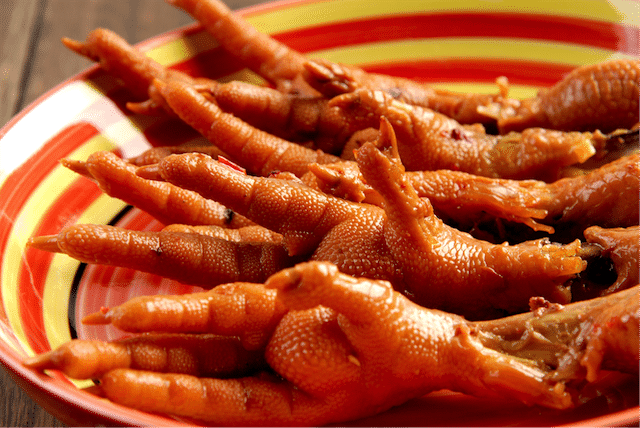 Come on – the sooner than you try this dish, the sooner that you can tell people you’ve eaten chicken feet! Not a dish for the faint of heart, gaebul is a type of raw sea worm served as is. While the texture can take some getting used to, gaebul has a distinct flavor that makes it worth trying. Don’t be too intimidated by its presentation – just think of it as a unique type of sashimi! Pick up some gaebul the next time you are at a Korean fish market, and be sure to let us know what you think in the comments below. Hamaeltang is a ‘live seafood soup,’ but perhaps not in the way you are thinking – while the seafood is initially live, it is cooked in a scalding soup before it is served, so the seafood isn’t technically live when you’re eating it. That being said, seafood doesn’t get much fresher than hamultang! This soup is made with a variety of spicy pastes and vegetables that give it a unique flavor and make it a favorite at Korean restaurants. Give a bowl of hamultang a try the next time you’re in the mood for seafood – after one bowl, you’ll be hooked! If you’re looking for the perfect snack on a chilly, rainy winter day, look no further! Soft tofu stew is amazing for a couple of different reasons. First, it combines distinct but very complementary flavors that make some magic happen in your mouth: the combination of silky soft tofu, kimchi broth, egg, and seafood is a force to be reckoned with. The contrast in texture between the seafood, tofu, and egg is especially fun. This is also a great dish if you’re looking for a protein fix – between the egg, the tofu, and the seafood, you have three different types of protein coming together to fill you up and leave you satisfied. Make some soft tofu stew the next time you need to warm yourself up! Make sure to make some steamed rice to enjoy with it – you can use the rice to soak up the last few spoonfuls of the soup when you get to the bottom of the bowl. If you’re a fan of #26 on this list, steamed mandu dumplings, we have a feeling you’ll love yaki mandu, its deep fried crunchy counterpart. Deep friend mandu are stuffed with a mixture of glass noodles, a variety of savory seasonings, and meat (usually pork) depending on the chef’s preference. Regardless of the filling, all yaki mandu is crunchy and absolutely addictive when it’s served piping hot with soy sauce on the side. 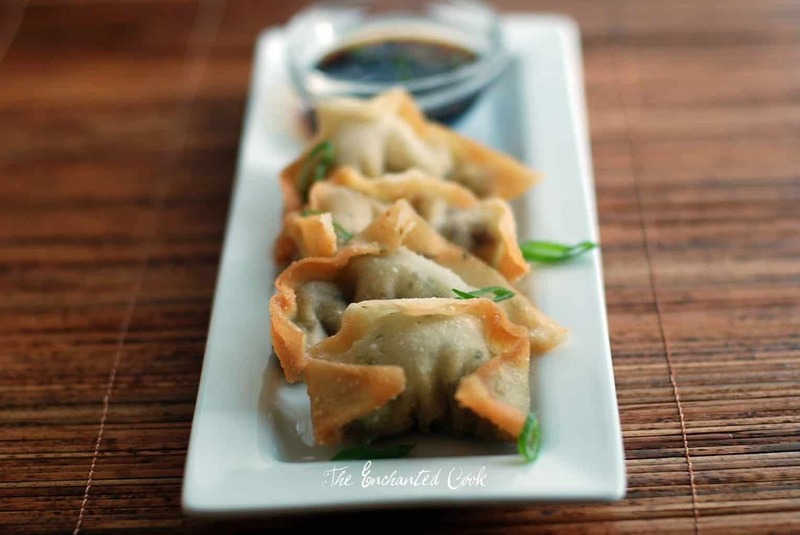 If you’re looking for a snack that is on the salty end of the spectrum, order some yaki mandu and you’ll be in for a treat. They’re also relatively inexpensive, so you’ll be able to enjoy a snack without breaking your wallet! One of the most popular dishes on this list, gimbap is a Korean take on Hawaii’s extremely popular take on Japanse sushi, SPAM musubi. 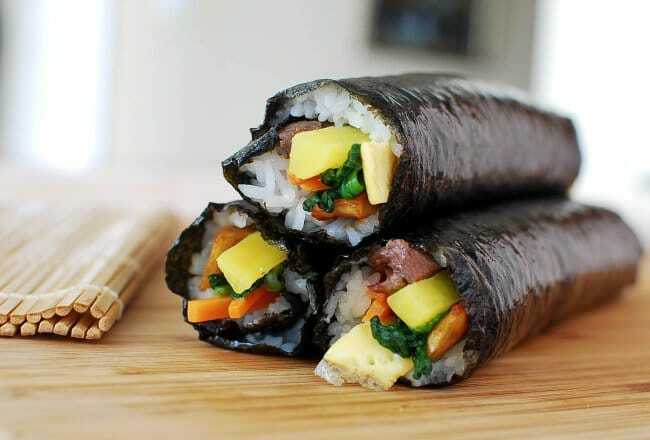 Gimbap is very similar to Japanese hand rolls in some ways including the sushi rice and pickled vegetables wrapped inside a sheet of seaweed. However, instead of highlighting fresh seafood, the protein featured in gimbap is ham. Gimbap is very easy to eat due to its shape, and it can be found both at street food carts and at full service restaurants. Whether you’re incorporating it into a larger meal or enjoying it as a standalone snack on a busy day, make sure that you make a point to try gimbap while you’re in Korea! If you’re a fan of anything deep fried (and really, who isn’t?) Korean tempura will be right up your alley. Very similar to Japanese tempura, Korean tempura consists of vegetables, various seafood, and rice coated in a thick batter and deep fried until each piece is tender on the inside and slightly crunchy and golden on the outside. Although it’s not particularly healthy, you should definitely indulge in this tasty dish while you’re on vacation in Korea. That’s what vacation is all about! Try squid tempura if it’s available during your travels – something about the squid meat and the tempura batter come together to make a combination of flavors that’s to die for. It doesn’t get much better than cheese tteokbokki – this dish is love at first bite for the cheese lovers out there. 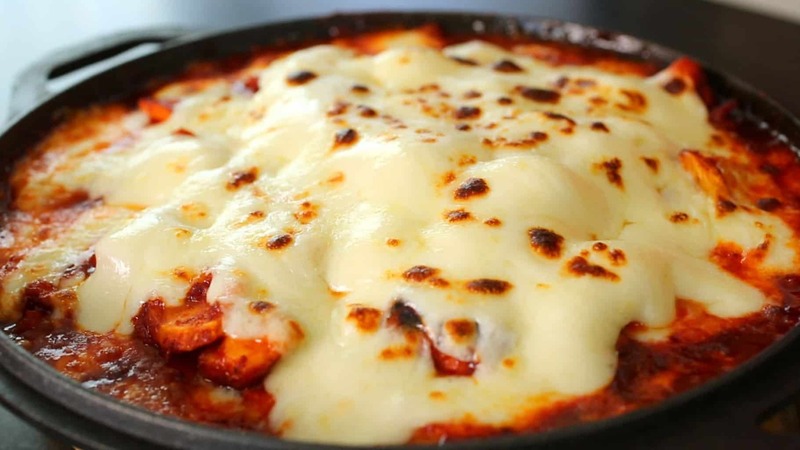 This dish starts with a Korean rice cake that is then covered in spicy chili sauce and topped with a layer of melted cheese to bring it all together. This is definitely a decadent dish, so you may need a nap after eating, but it’s totally worth it. Check out cheese tteokbokki the next time you feel like you need to treat yourself. 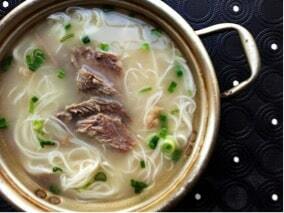 Korean cuisine incorporates different flavors, textures, and combinations that many cuisines steer away from. As a result, many authentic Korean dishes are likely different from anything you’ve experienced for. 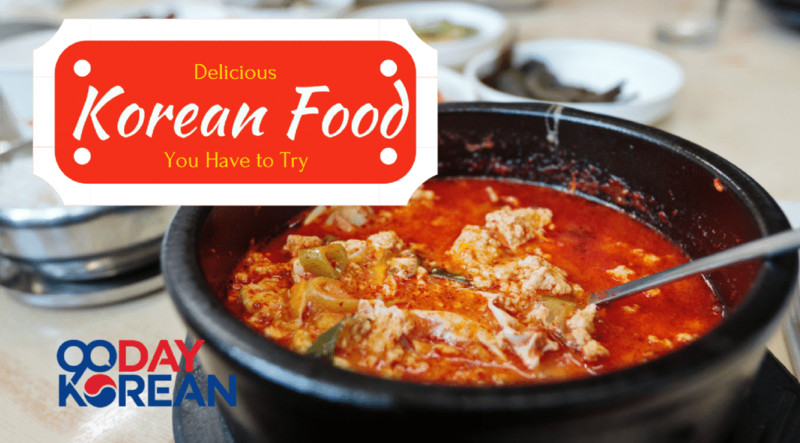 Try some dishes from our list to give you a taste of some of the most popular flavors in Korea – and keep experimenting! We’ve barely scratched the surface of the variety of dishes that will be available to you throughout your journey to learn to speak Korean, so travel forward with an open mind and an empty stomach. Looking for something a little more daring? Then why not try some of Korea’s more unusual dishes? Have you tried any of the dishes on this list? If so, what’s your favorite? Let us know in the comments below!